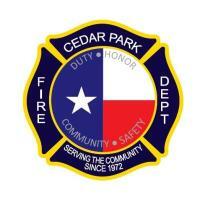 Please speak a little about what your business (Cedar Park Fire Department) excels at. Please mention any awards, announcements or kudos you would like the Chamber Members to know about. The Cedar Park Fire Department is proud to serve the residents and businesses of the City of Cedar Park and the City’s ETJ. The fire department is broken into three divisions. 1. Fire Administration and Training who makes sure that all members are equipped, trained and prepared to take care of the needs of the community on a daily basis. 2. The operations division who responds and provides care, mitigates emergencies, handles public service requests for the community. (They are the most visible as they respond in teams of four on the big red fire trucks.) 3. The prevention division who is responsible for making sure all commercial buildings are built safely and are maintained so residents and customers are safe as they send time in the community. The prevention division also investigates all suspicious fires within the City of Cedar Park. As the Fire Chief, I am proud of the positive public image the fire department has built. The Cedar Park was one of only 15 fire departments nationwide to obtain Accreditation by the Commission on Fire Accreditation International while also holding a Class 1 rating from the Insurance Services Office through the Texas Department of Insurance in 2014. What is your role, how long have you been in this role, tell us about your background? The Fire Chief provides for the protection of life and property from fire; assures that life support services are provided at the scene of an emergency; ensures that the public is educated about fire prevention; ensures that fire, safety, and health inspections are conducted in accordance with city, state, and federal standards. Duties include supervising the department and its employees; planning and budgeting for future departmental activities; commanding firefighting team during emergencies; and acting as a liaison between the department, other public employees, and the general public. I have served as the Fire Chief for the City of Cedar Park for the last 6 years and as an employee of the City of Cedar Park Fire Department for the last 23 years. I have been in the fire service in different roles for the past 30 years. While originally raised in Wisconsin, (go Packers) I have lived in Texas since 1979 and in Cedar Park since 1995. My wife Luci and I have raised our two children, and one grandchild in Cedar Park and many of my immediate family live in Cedar Park. Why do you enjoy being a member of the Cedar Park Chamber of Commerce? I enjoy being a member of the Chamber and that it allows me to interface with businesses in an around Cedar Park. I am a past graduate of Leadership Cedar Park and enjoy many of the Chamber activities.